Hike out from Kennedy Grove Rec Area along the Bay Area Ridge Trail for an out & back stretch on the San Pablo Dam Trail to San Pablo Reservoir. Return to Kennedy Grove for a hike around Laurel Loop Trail to Lower and Upper Sea Foam Trails. 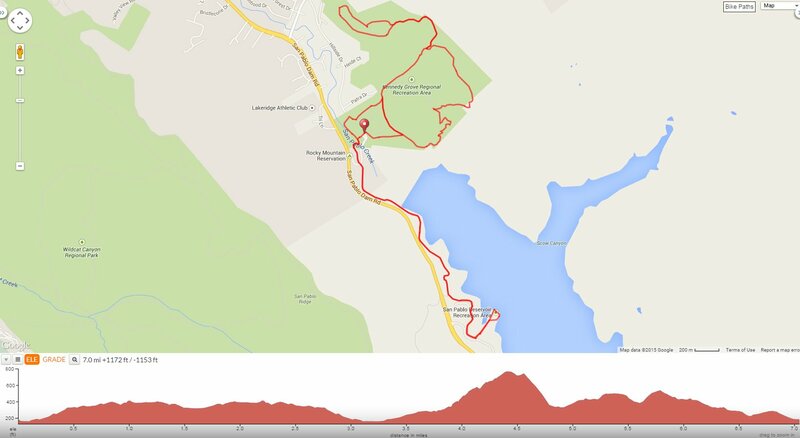 Continue on the Black Oak Loop and Kennedy Creek Trails to the main parking lot. Begin this hike from the SW end of the main parking lot; cross the lot onto the Bay Area Ridge Trail. Cross San Pablo Creek and make your way out of the woodlands to the open meadow. Cross the main road to the the gated entrance into EBMUD‘s watershed area. Mile 0.2-At the trail junction: go right onto Old San Pablo Trail. The trails winds along the grasslands towards Old San Pablo Dam Rd. Mile 0.4-at the trail junction: go left to stay on Old San Pablo Trail. The trail continues on pavement for a short distance towards the dam before switching back to unpaved conditions. Mile 1.25-at the trail junction: go straight towards the eucalyptus stands; the trail returns to solid pavement as it winds along San Pablo Reservoir to the north entrance of the rec area. At mile 1.4-turn left at the stop sign and continue through the parking lot towards the Visitors Center/Cafe, Marina and picnic area at San Pablo Reservoir. Walk out towards the shoreline and enjoy the serene reservoir views! Reverse your way out of the rec area and return on the Old San Pablo Trail and Bay Area Ridge Trail to Kennedy Grove. Mile 3.1-after crossing San Pablo Creek: go left to stay on the Bay Area Ridge Trail. The trails follows the creek under the eucalyptus stands to Fern Cottage before exiting out onto the parking lot at the north end of the park. Walk through the lot towards the picnic area. Mile 3.3-at the trail junction: turn left onto the Laurel Loop Trail. The trail leads you through the picnic areas underneath the shade of the tall eucalyptus groves towards the Dog-Off Leash Area. Mile 3.5-at the trail junction: turn right to stay on Laurel Loop Trail; the trail gently winds through the woodlands to the open clearing. Mile 3.7-at the trail junction: go straight onto Sea Foam Loop Trail. The trail goes along the north end of San Pablo Dam to Lower Sea Foam Trail. Mile 3.9-at the trail junction: turn left onto Lower Sea Foam Trail. The narrow trail heads underneath oaks and continue on a steep incline through dense chaparral and sagebrush. With every turn, you can catch a good glimpse of San Pablo Reservoir and the gorgeous San Pablo Ridge! Mile 4.2-at the trail junction: turn right and continue the ascent on Upper Sea Foam Trail. Stop at the vista area and enjoy the magnificent views! Upper Sea Foam Trail weaves uphill along the grassy ridge line to a bench that is nearly hidden with dense chaparral. Look around and take in the magnificent views of San Pablo Bay, San Pablo Dam and San Pablo Ridge! The trail continues uphill through the dense woodlands to the park’s high point. Mile 4.4-at the trail junction: turn left to stay on Upper Sea Foam Trail. The trail continues under the canopy of dense oaks and sharply turns left for a moderately steep descent into the canyon. Caution-this section of the trail is heavily populated with poison oak; the leaves glisten with oil under the dappled sunlight. The switchbacks are followed by a quick rise and drops down from the woodlands to the next signed junction. Mile 4.9-at the trail junction: turn right onto Black Oak Trail. The trail leads out to the open grasslands with views of the Sobrante Hills neighborhood along Sobrante Ridge. Mile 5.2-at the trail junction: go straight to stay on Black Oak Trail. The gentle incline leads out to another open stretch of grasslands. Mile 5.3-at the trail junction: go straight to Black Oak Loop Trail. The trail goes along the ridge with fantastic views of San Pablo Ridge and its outlying residential neighborhoods. Mile 5.6-at the trail junction: turn right to stay on Black Oak Loop Trail. It ascends through the dense oak woodlands to a high point at a shaded picnic area- it’s a perfect place for a lunch stop! Mile 5.8-from the picnic area: go left to the next signed junction. Mile 5.9-at the trail junction: turn left onto Black Oak Trail and retrace your way back to the junction at Upper Sea Foam Trail. Mile 6.3-at the trail junction: go straight and continue on Kennedy Creek Trail. The trail winds down along the creek to Laurel Loop Trail. Mile 6.6-at the trail junction: go straight and continue on Laurel Loop Trail. The trail leads you back through the shaded picnic area and ends near the open lawn area. Continue along the paved path towards the restrooms for the return to the parking lot. This is a fabulous scenic hike around our local watershed and recreation areas near the base of San Pablo Dam. You really don’t have to go very far to enjoy the outdoors! Sunny and warm with clear blue skies. Temps ranged from the low to mid 60’s with brisk NW winds. Parking Fee: $5 seasonal-weekends & holidays. Fees are charge from April 1 to Oct 31.